Last time, I wrote about San Francisco’s new-wave Hawaiian and Middle Eastern restaurants, calling them out as being a recent trend. Another newish development that’s spread across the US since I last lived there has been fresh, fast casual restaurants, that are a bit more upscale. When I think of the first wave of fast casual restaurants, I think of Panera and Chipotle. Urban Plates would be a step up from those, because it’s a bit more restaurant-like with real china plates and silverware, and seasonal proteins and vegetable sides. Real sit-down food. It’s also a different breed than Boston’s Clover restaurant chain, which is more fast food, yet with more inventive dishes. 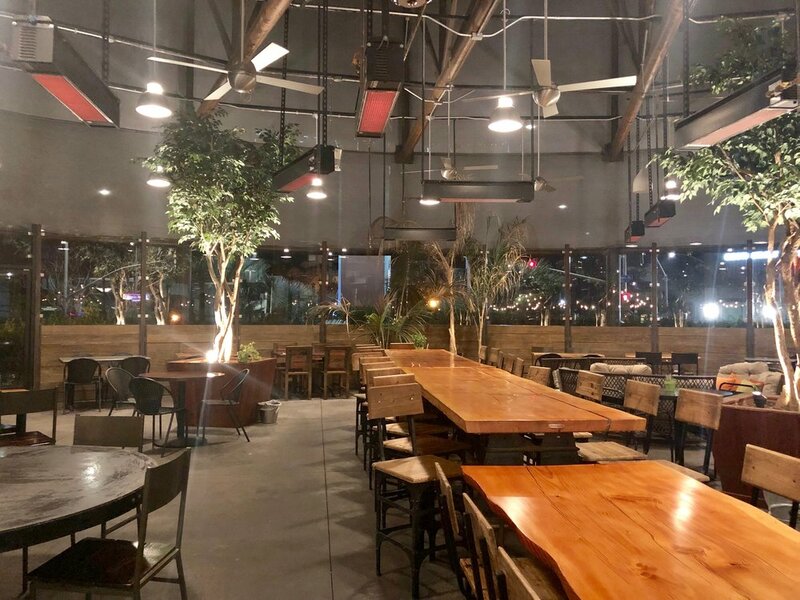 At the La Jolla location, the majority of the seating is outdoors, in a covered and heated patio area. At busy times, most of these tables were full. The menu is separated into groups: “Urban Greens” aka entree-sized salads, Sandwiches, Plates (a protein and two sides), and Urban Bowls (when I went, there were items like a meatball braise and osso bucco). You take a tray, like in a cafeteria, and then line up in front of the station corresponding to the menu group, and the server there plates your meal. Often, the sides are what interest me the most, and ordering a Plate seemed to me the best way of trying the sides. So I ordered a chimichurri grass-fed steak, with sides of brussels sprouts and a beet salad. A slice of “chargrilled rustic bread” comes with the plate. Everything was delicious! The steak was tender - they weighed it to be sure portions were standard -, the brussels sprouts were just tender enough to not be bitter but still have a bite to them, and the beet salad was refreshing. Ordering the steak, I realized that basically that the eight or so Plates on offer boiled down to five proteins (chicken, steak, albacore tuna, salmon, meatloaf), with or without some type of sauce like the chimichurri or kimchi aioli. So you really could customize your meal even further. In the line to the cash registers, there was a very tempting display case with a selection of legit-looking desserts. The one that really caught my eye was a walnut cake with vegan pumpkin mousse. Having just made a whole brunch with dairy-free recipes (and always loving nuts in everything), I was very curious about this cake. And it was so good! The pumpkin mousse had the usual pumpkin spices, but also had turmeric, which gave it a bit of an exotic flair. I’ve now just read that the walnut cake was sweetened with dates and raisins. (I usually don’t like raisins, so I’m glad I actually didn’t know that it contained raisins when I ordered and ate the cake!) And not only was the cake vegan, it was also gluten-free and refined-sugar free. They did a very good job of creating very “conventional” textures with unconventional ingredients. 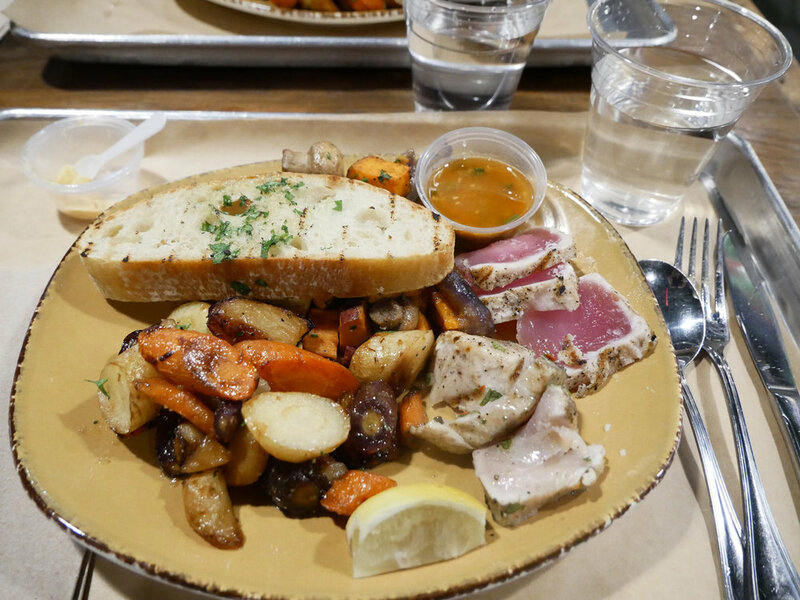 On my next visit, I ordered the albacore tuna with a miso ginger sauce, and my two sides were miso mushrooms with sweet potatoes, and carrots and beets of different colors. I loved all of these vegetables. I want to eat more vegetables in general, but sometimes they are just so time consuming to prepare. Washing, peeling, dicing/cutting/shredding/grating, then the cooking part. Not to mention going out and buying such a variety of vegetables: there were golden beets and purple carrots along with regular orange carrots. This is why I wish an Urban Plates would open in Spain! The albacore I was a bit more lukewarm about. When I ordered my plate, they had just run out of albacore tuna, so I took a number and they brought my plate to me freshly made. My albacore was seared on the outside, rare on the inside. My mother who had gotten the last of the last batch, had the end bits which were pretty well-done throughout. So I offered to split half-and-half with mine - you can see the rare tuna above the well-done tuna in this photo. I actually preferred the well-done tuna - more flavorful I thought -, though that is probably not how it was meant to be served! Urban Plates was so good, I went a third time during my short visit to San Diego. Having tried all of the side dishes that interested me, this time I went for a salad. For some reason, I love salads. I love all sorts of different ingredients and textures coming together. I also find it quite time-consuming to make a good salad. Because I have to prepare a ton of different components, from cutting vegetables to grating cheese to baking crunchy bits. So it was such a luxury getting this beautiful salad made for me! I ordered the “Desert bbq chicken” salad, with romaine, the chicken that comes from the Plates station, topped with organic romaine, grilled cage free chicken, corn, black beans, grilled onions, avocado, organic cheese blend, crispy wontons, red bell pepper, chipotle-lime dressing.” Speaking again to the dream it would be to have such a restaurant near me, I have to mention black beans. I never have the luxury of putting black bean in my salads in Spain, because they don’t sell them in cans, so I have to make them from dry beans; and who wants to make beans from dry when only 10 beans go in a salad?! And I will also mention the corn. How easy would it be that they used canned corn? But the corn in this salad was corn shucked by hand - I could tell because they came off in little slabs of kernels stuck together. This was a salad I truly loved. When I was waiting for my salad, the lady behind me ordered a “steak salad with chicken and no steak,” and various other substitutions, so I learned that the salads can also be customized. Next time I want to try this very same salad, but with chimichurri sauce instead of the barbecue sauce, as good as the barbecue sauce was. So, three visits in a week and a half. Urban Plates is a place I’d go to all the time if I lived near one: comforting recipes, variety, and lots and lots of different vegetables. Eating healthily is made easy here.